Chris Christie in Iowa: Convinces one voter he’d be a great education secretary. Chris Christie pauses as he participates in a discussion during the 42nd annual Conservative Political Action Conference (CPAC) February 26, 2015 in National Harbor, Maryland. AMES, Iowa—The applause didn’t come until the end, and even then it was more polite than rousing. Chris Christie had spent the past hour laying out his vision for reforming public schools and higher education in America, but not once did the crowd offer the New Jersey governor the type of spontaneous cheers maybe-presidential candidates come to Iowa for. The audience of around 100 listened intently, and laughed occasionally, but the atmosphere was more classroom than campaign rally. For all its wonky details, though, Christie’s policy speech was peppered with potential applause lines—at least on paper. There were appeals to campus pride: “It was Iowa State that helped usher in a new digital age.” Nods to partisan identity: Free college is “a typical liberal approach—it is wrong, and we know it.” And even some the-children-are-our-future rhetoric for good measure: “Every hardworking student and teacher is leading us into the future.” Yet the applause never came, either because Christie never paused long enough to encourage it or because the speech overall was too serious to get the crowd going. Still, that a roomful of Iowans was somewhat skeptical of Christie is probably less notable than the fact he had a roomful of Iowans to speak to in the first place. 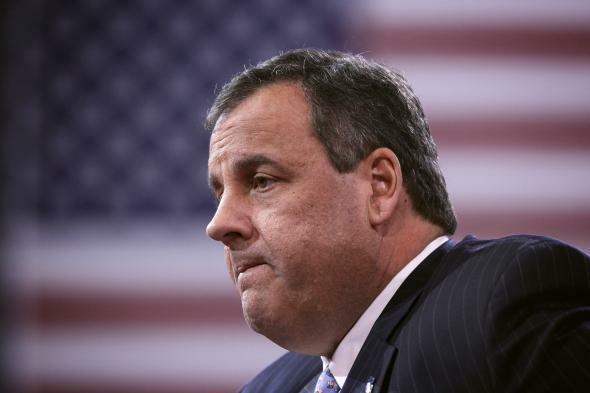 In the most recent Des Moines Register/Bloomberg survey, Christie placed 9th in a crowded field with just 4 percent of likely GOP caucus-goers naming him as their top pick. In the same poll, Christie’s favorability split was well underwater, with more than twice as many people viewing him unfavorably as favorably. The only possible GOP candidate with a higher unfavorability rating than Christie’s 58 percent was Donald Trump’s 63 percent. When you’re in the same breath as a reality TV star best known for his hair, perhaps the surprise isn’t that the crowd isn’t clapping but instead that they’re willing to listen at all.